Hola from Barcelona! I'm still pinching myself that I'm finally here. 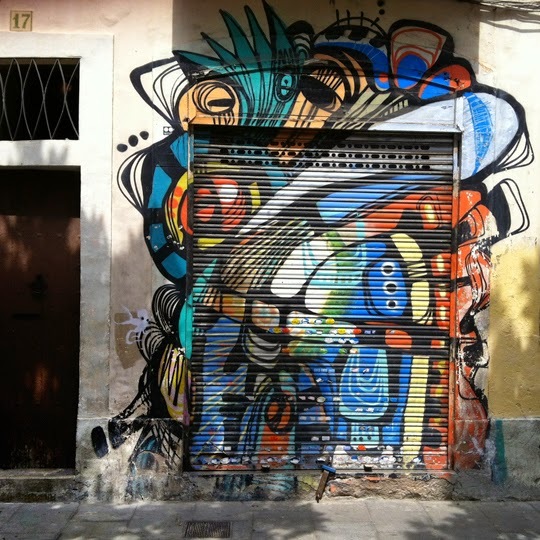 Barcelona is such a vibrant, creative place, with art, architecture, colour and patterns everywhere, so I thought I'd share some of my impressions. 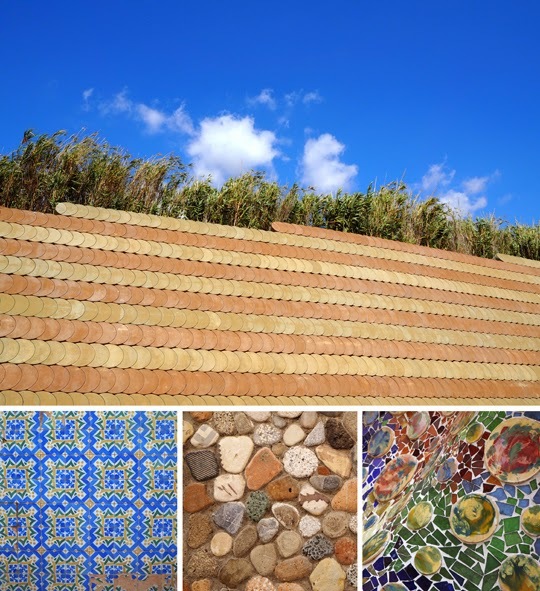 While the temperature in Barcelona hasn’t been that high, the humidity can make it very uncomfortable and the days that are airless are intense. 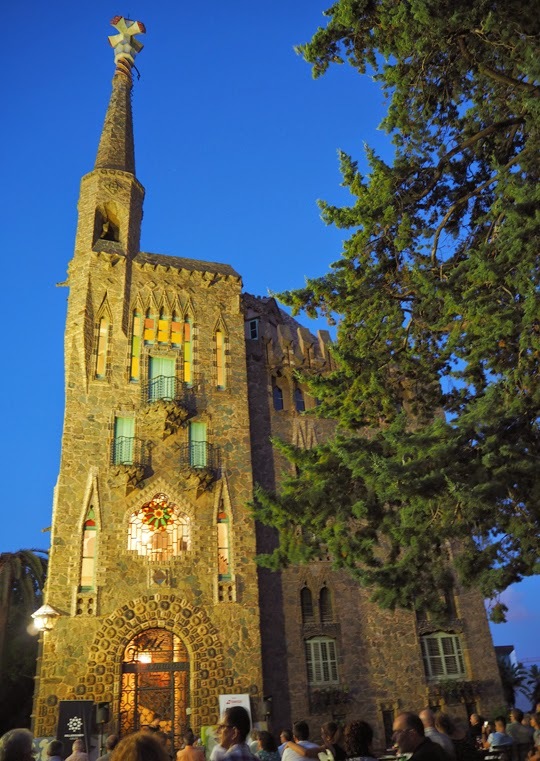 Getting up high for a little bit each day – on a hill outside town for a jazz concert in Gaudi’s Torre Bellesguard, or on a rooftop at his Casa Botlló – where the air is cooler and you can feel a breeze, definitely makes it bearable. In general I’m loving the heat after the winter at home. I can just feel the stress of the last few months melting away. Barcelona rooftops from Casa Botlló. 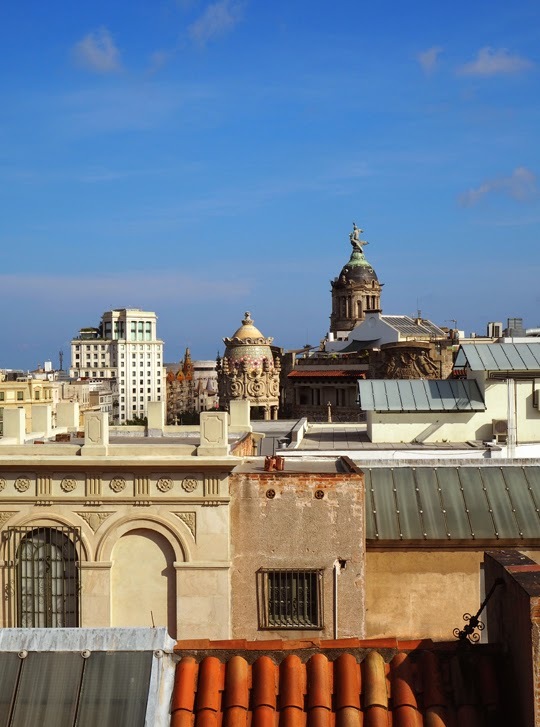 Barcelona is a city where the very old is living alongside the strikingly new. The gothic quarter was filled with contemporary public art, the majority of the buildings in L’Eixample are ornately styled Art Nouveau masterpieces – a period of architecture I’ve not been exposed to much before, but I loved it – and street art sits alongside massive restoration projects in many of the city’s suburbs. Public art in front of Basilica de la Mercé, Barri Gòtic. Street art in Vila de Graciá. The light here is dazzling, and the skies are the deepest of blues. I’m making the most of each day with endless walking. It’s light until 9.30pm so there are plenty of hours to be out exploring. I think I was born for the Spanish lifestyle of work that starts at 10am, a rest in the middle of the day until the worst of the heat is over, and then some more work before an evening meal when it finally falls dark. 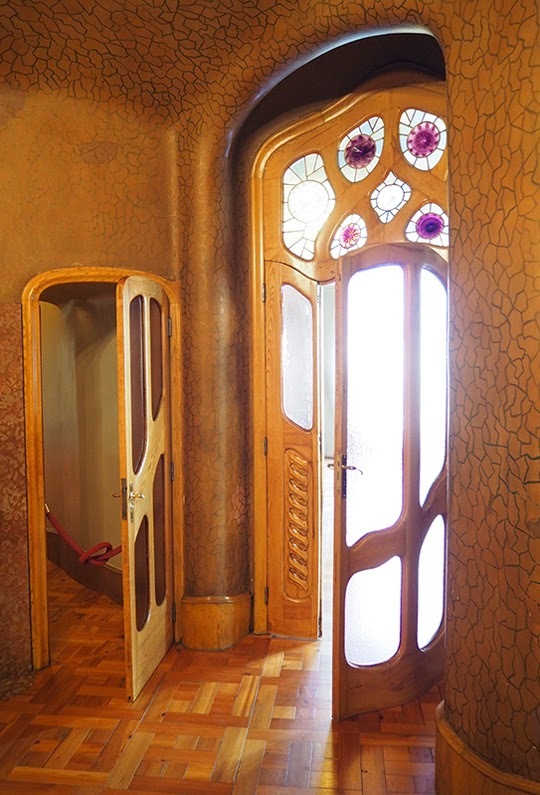 Gaudi was ahead of his time in designing for optimum airflow and light – Casa Bottló. Coming from a country whose built environment is a mere 200 years old, I’m always fascinated wandering a city with a history older than I can fathom. The house at Torre Bellesguard was built in the 1500s and the land has been used for habitation for much longer. Can you imagine living in a house that has been occupied for 500 years? Guadi's Torre Bellesguard at dusk. Even the pavement stones in Barcelona have their own special pattern – a simple four-petalled flower. 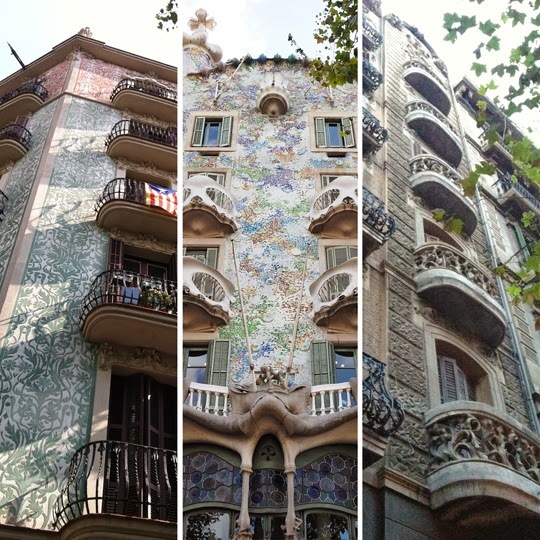 There is pattern everywhere – the Art Nouveau houses painted pastel shades and covered with intricate, stylised flowers and leaves, the wrought ironwork on the balconies in the gothic quarter with a different pattern for each building, the mosaic tiles of Gaudi and even new building works with their simple geometric shapes. 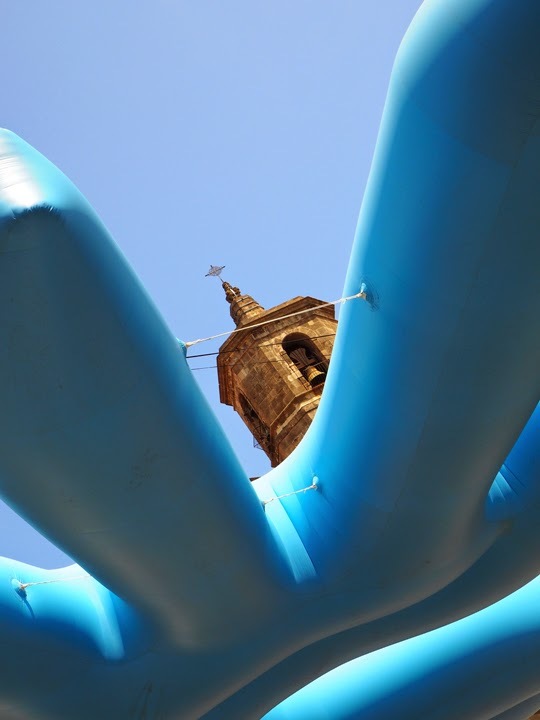 We are now on a train heading for Bilbao after a few days in Logroño – what a surprising little gem of a place that was. I do have some textile loveliness to show you from Barcelona, but that can wait until my next post. I’m also trying to keep the pics from my Instragram feed quite different to the ones here (so I don’t bore the people who are following both! ), so if you want to see a few more of the Barcelona images you can check them out here. Thanks Stace. You'll be glad to know there wasn't a pick-pocket in sight in Barcelona. We're in Madrid now which is our last stop before I head out to Mexico.